This style ZCB-1 coin bag - zipper pouch can be made in almost any size and color. It can be used as a money bag or to store any items you desire. The stock pouches are made from 10.10 duck, which has a softer hand than the typical number/chair ducks. 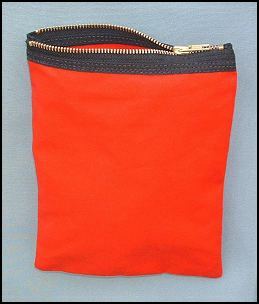 A pouch similar to this has almost endless uses from storing an item (s) to making up coin/cash banks. The bag shown here is 7 inches wide by 10 inches high. This like all our bags and pouches can be altered in size and options to accommodate your needs. Custom size pouches will be priced according to size.